*Disclaimer: No current Sunflower League players were eligible in the selection process. Leonard was basically an ATM (automatic touchdown machine) for SM West whenever they reached the redzone territory. His fades routes to the corners of the endzones became legendary, as did his talents across Kansas. In SM West's run-heavy offense Leonard combined to catch 53 passes for 930 yards and 19 touchdowns in his junior and senior seasons, helping SM West to win 21 games in that time frame. He went on to play at Wyoming where he became one of the top receivers in the history of the school. Parks was a star-performer on both sides of the ball and on special teams for Olathe East during his career. As a senior he caught 42 passes for 750 yards and 11 touchdowns helping Olathe East to an undefeated regular season and Sectional Round playoff appearance. He went on to player receiver at Oklahoma State after a stop at Butler County C.C., but his career was cut short when a visit to the hospital revealed that Parks only had one kidney, and continuing to play would risk injury to the kidney and possible death. I don't have any season stats for Winslow, but he was easily one of the top receivers the league over the past decade or so. A good portion of John Martin's 4,000 career passing yards were to Winslow, and Winslow was an Class 6A All-State performer in his junior and senior seasons, helping SM North a Sub-State appearance in 2000. Parks teamed up with Anthony Riley (who narrowly missed this list) to make one of the top receiver tandems in in the city in 2005. Parks was the favorite target of quarterback Derek Miller in 2004 and 2005, as he used his small stature (5-foot-10, 165 lbs.) to find openings in opponents' secondaries. He was arguably the top receiver in the metro in 2005, catching 41 passes for 652 yards and eight touchdowns. Lewis would have received alot more publicity had the SM South teams he was on done a little better during his time as a Raider. As a senior he led the state of Kansas in receiving yardage with 1,141 yards on 65 catches in nine games. His efforts helped SM South to a near defeat of Olathe North (who carried a 27-game winning streak when the two teams met that season) in week four. Morris was a dominant possession receiver and he had a tremendous ability to go up and snag a ball over defenders--this ability likely carried over from his prowess on the basketball court. As a senior he caught 40 passes for 659 yards and 11 touchdowns in helping Olathe South to a state championship game appearance. Over the course of his two seasons as a starter Faerber combined to catch 103 passes for 1,563 yards and 12 touchdowns despite battling several injuries as a senior. He was an essential piece of the Lancers' playoff berths in 2010 and 2011 and next fall he'll be taking his talents to the University of Illinois to play receiver. Cauley used his extraordinarily tall 6-foot-10 frame to hover above SL defensive backs for his lone season of football at the high school level. He caught 64 passes for 1,265 yards and 15 touchdowns this past year, and in doing so he helped Olathe Northwest to a 5-5 record and playoff berth. Woods was Mack Brown's go-to receiver in 2004 as he caught 46 passes for 769 yards in the Indians' nine game season. Despite predecessors like Winslow, Drew Murrell and Brooks Faddis, Woods has gone down statistically as one of the best receivers in SM North school history. Murrell was another great SM North receiver in the early 2000s. 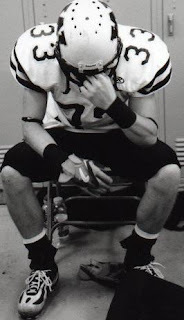 He capped off his career by catching 50 passes for just over 900 yards during the 2002 season, helping SM North to a Regional Round playoff berth. Isnt Faerber going to Northern Illinois? No, Eli is correct, he's going to be an Illini. Besides Jason Gore, and maybe Randy Shephard (more of a defensive back) the pickings for Olathe North at receiver were pretty slim.